Kathleen holds a vision for a peaceful, just and sustainable world. She’s worked as a Certified Trainer for the Center for Nonviolent Communication (CNVC) since 2003 and serves as an assessor for this international organization. For over 25 years Kathleen has explored ways to restore harmony to communities including two decades as a music conductor and seven years as a public school music teacher. Kathleen supports organizations and communities to engage with conflict in life-serving ways. She offers trainings, facilitation and mediation in concrete skills of nonviolence leading to reconciliation with ourselves, our loved ones and the community. Kathleen— “These Giraffe Tales were written during a transition period in my life. I had been a music conductor for about 15 years and during that time had brought the world of classical music to children through concerts and a CD with folk tales set to music called “Tales Told in the Winds.” At the same time I was studying Nonviolent Communication to try to understand how to create and sustain harmony in the world in our relationships on the interpersonal and systemic levels. It seemed like the message of Nonviolent Communication could be told through children’s stories set to music, so I wanted to give it a try. My hope in writing the stories and having them set to music was an attempt to interlace two worlds I was passionate about. The CD “Giraffe Tales” is the product of that attempt. I loved the illustrations that Kenneth created for the CD cover and hoped we would someday have books that children could read along with as they listened to the recorded stories. 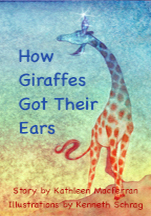 How Giraffes Got Their Ears is a fictional story about the time when Animal Maker was creating giraffes. Giraffes loved all parts of their bodies except their ears. Their ears heard so many things that it was hard to focus on what was most important to hear. Animal Maker let them try out a variety of ears, including mouse ears and elephant ears. Finally, Animal Maker made a pair of ears that giraffes loved. These special ears helped giraffes hear the beauty in all hearts, even when the beauty was hidden. Exquisitely illustrated by Kenneth Schrag, How Giraffes Got Their Ears is just right for wee ones who love being read aloud to and for children just learning how to read, ages 4-8. 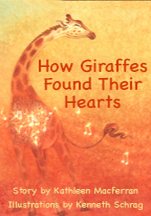 How Giraffe Found Their Hearts is a fictional story that follows the search of Jordan giraffe as she searches for something to fill the hollow, empty space in her chest. Acting on the advice of her friends in nature, Jordan tries to fill her chest with carrots, stars and pond water. After several unsatisfying attempts, Jordan hears the song of a young boy and follows the sound until she meets him. The boy helps Jordan hear the song inside herself, and in doing so, she discovers her own heart – the very thing she was searching for all along. Beautifully illustrated by Kenneth Schrag, How Giraffe Found Their Hearts is just right for wee ones who love being read aloud to and for children just learning how to read, ages 4-8. Choice is a nonfiction pocket book co-authored with Jared Finkelstein. This book is about creating a reflective space where the reader can explore choices and philosophical perspectives that go beyond right and wrong and into the realm of interdependent relationship. Based upon the key differentiations and principles of Marshall Rosenberg’s Nonviolent Communication, this book provides a rigorous investigation of the life-serving motivation embedded in concepts which sometimes appear as polar opposites. Through differentiation and nuanced exploration of these concepts, light is shed on the life-serving purpose at both ends of a seeming continuum between ideas. 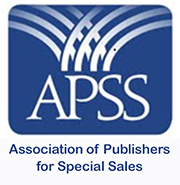 Readers are invited to apply on a personal level a consciousness that leads to self-responsibility, connection and collaboration. Choice would be of benefit to individuals, community leaders, city councils, schools, and organizations in their work with conflict resolution, more effective communication, decision-making, etc. Jared Finkelstein is a Certified Trainer with the Center for Nonviolent Communication who believes that in a connected world what’s essential is the quality of our connection. As a consultant and trainer he specializes in supporting people and communities to make choices that transform separation and misunderstanding into connection and collaboration. Jared is devoted to the idea of intergenerational interdependence. In organizations, schools, homes, and camps, he brings the practice of Nonviolent Communication as a strategy to explore how to fine tune the qualities of connection in all our relationships, and for everyone’s benefit.